In a career spanning 40 years, Morry Schwartz has built a reputation for publishing the highest quality journalism in the country. The Saturday Paper is Schwartz’s first weekly venture, joining other Schwartz titles including The Monthly, the country’s leading current affairs magazine, and the agenda-setting Quarterly Essay. The Monthly has won the Current Affairs, Business & Finance category at the Australian Magazine Awards. Alongside the Quarterly Essay, it has published a suite of Walkley Award-winning pieces. Australian Foreign Affairs is a triannual journal that explores and debates the urgent challenges facing Australia and the region. The Saturday Paper is a new way of doing news. The Saturday Paper is a newspaper for independent minds, for people who want the whole story. We make serious news for serious people. The Saturday Paper is the essential guide to week’s news and politics, alongside the best in culture, food, commentary and lifestyle. We are Australia’s only newspaper dedicated to long-form reportage. A unique publishing phenomenon, the Monthly magazine has become one of Australia’s boldest voices. Home to the finest thinkers, journalists and critics, The Monthly offers enlightening commentary and vigorous, sometimes controversial, debate on the issues that impact our nation. Rich in substance and style, The Monthly is sought out by a who’s who of business, politics and the arts. It is essential reading for those wishing to be deeply engaged with Australian culture today. AUSTRALIA'S LEADING JOURNAL OF POLITICS, CULTURE AND DEBATE. Quarterly Essay aims to present the widest range of political, intellectual and cultural opinion. Award-winning essays include Political Animal and Power Trip by David Marr, That Sinking Feeling by Paul Toohey and Stop at Nothing by Annabel Crabb. Authors include Tim Flannery, Don Watson, Robyn Davidson, Germaine Greer, Robert Manne, George Megalogenis, Laura Tingle, Anna Krien, Waleed Aly, Inga Clendinnen, David Malouf and Noel Pearson. AUSTRALIAN FOREIGN AFFAIRS IS A TRIANNUAL JOURNAL BROUGHT TO YOU BY THE PUBLISHERS OF BLACK INC. AND QUARTERLY ESSAY. The country’s leading foreign affairs journal addresses the most significant global issues affecting Australia. Articles are topical and wide-ranging and have discussed the rise of China and the election of Donald Trump through to Australia’s development of an independent foreign policy and the turbulent relationship between Australia and Indonesia. 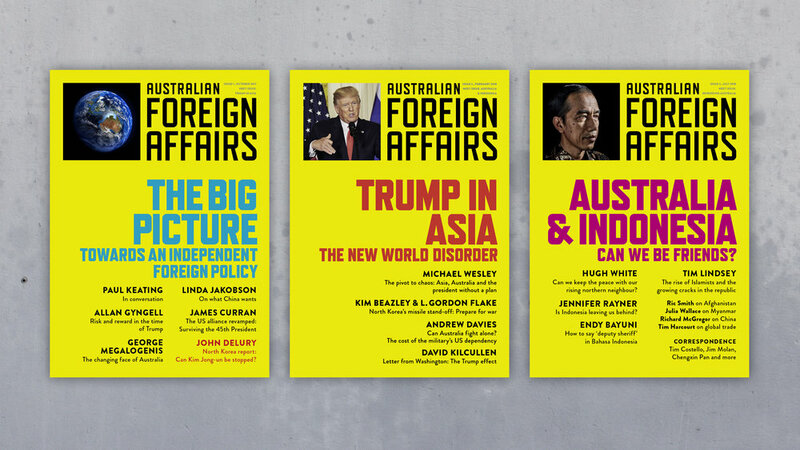 Contributors to the journal are amongst Australia’s top thinkers on foreign affairs and include Paul Keating, Kim Beazley, L. Gordon Flake, Linda Jakobson, Allan Gyngell, George Megalogenis, Jennifer Rayner, Michael Wesley, Hugh White, Tim Lindsey and more.